This rustic holiday home is located in the Umbrian countryside, near the village of Collazzone and the towns of Todi and Marsciano. There are three rustic, stone dwellings, housing 7 apartments in total. The ancient Umbrian houses retained their authentic atmosphere as part of the restoration: the wooden ceiling beams and cotto flooring tiles are all still there. The interior is rural and cosy. The infinity pool is surrounded by a magnificent garden with olive trees and Mediterranean plants. 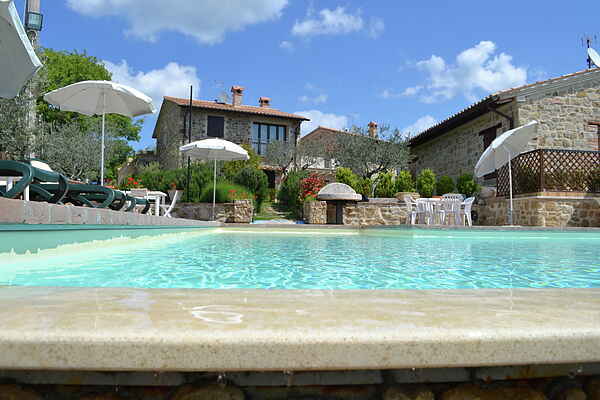 The swimming pool boasts a unique panorama, taking in the Tiber Valley, the many hills, the town of Todi, Monte Martano and the Sibillini Mountains. There's a waterfall on the other side of the pool. In another corner of the garden, you can relax in a small Jacuzzi while enjoying the peacefulness of the countryside. The surrounding area offers plenty of excursions on foot, by bike or by horse. Don't forget to visit the art cities of Perugia, Assisi, Gubbio and Spoleto. This holiday home is an ideal place to relax and explore the surroundings.